“And where does your next trip goes to?” asked a work colleague of Lydia. “To Kazakhstan!” was what she replied. The colleagues of Lydia know that she likes different holiday destinations. Last time she even was in Tibet! The coworkers expected a similar exotic destination. He was about to say “Wow” when he got her weird destination as a reply. He couldn’t hide his surprise. “What the hell do you want in Kazakhstan?” was what he said. Several people I met who’ve been already to Kazakhstan told me that they had a similar experience. Many of their friends couldn’t understand why people actually go there. And many have the stupid movie “Borat” as the first connection to the country even if this movie has absolutely nothing to do with Kazakhstan. This country is from its area the ninth biggest country of the world. There is a lot of steppe indeed but there should be also more in such a huge country right? Lydia was choosing this destination because she wanted to join me for almost three weeks on my way home from India to Germany. And after some research she was interested in this country. Now it has been already a while since we left Kazakhstan. I would like to talk about this country now. The journey is worth-it. The Republic of Kazakhstan is with a size of 2.7 million square kilometer the ninth biggest country of the world. It borders in the north and the west to Russia, in the east to China and in the south to Kyrgyzstan, Uzbekistan and Turkmenistan. It is the country on the world which is the most far away from the ocean. The geographical location has an influence to the climate. 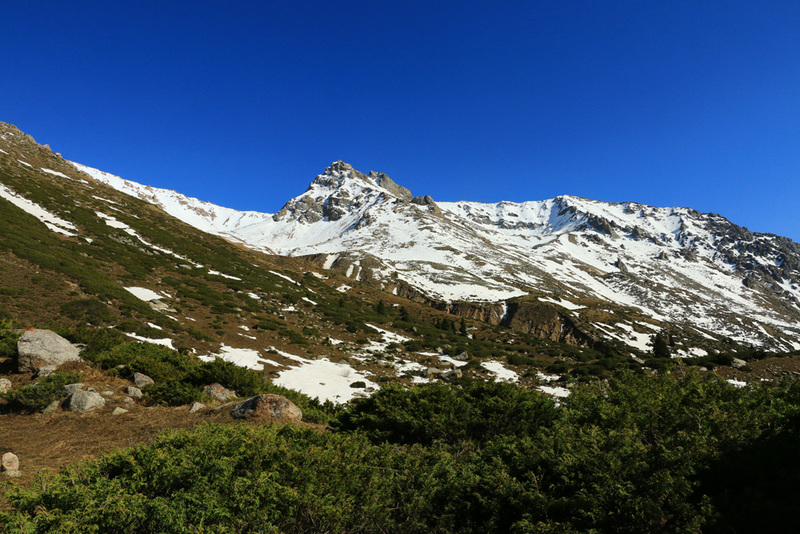 Hot and dry summers are going almost without any transition to winters with less snow. Indeed in the mountains though there is a lot of snow in the winter. Kazakhstan became independent after the fall of the Soviet Union in 1991 and is ruled since then of the president Nursultan Nazarbajev. 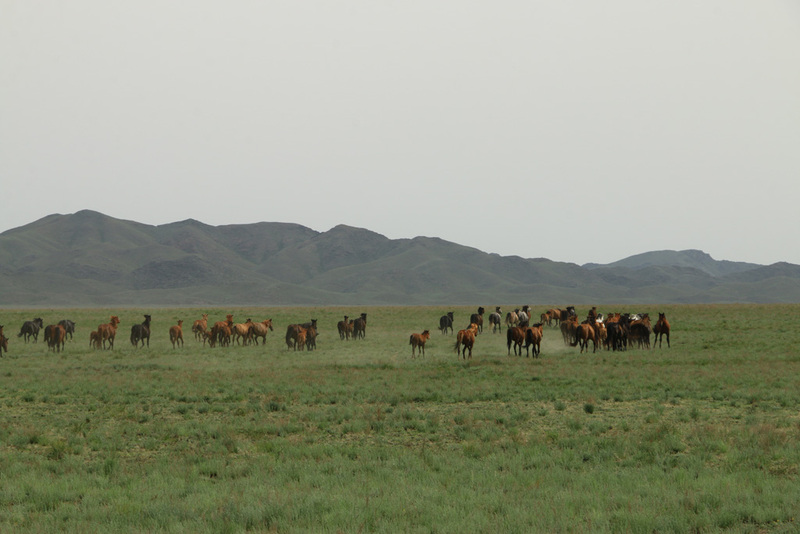 The history of the country is moving and the culture of the people of the steppe almost got lost. In the 15th century a group of people (descends of Dshingis Khan) in the area of today’s Kazakhstan was first called as “Kazakhs” which comes from the Turkmen word for “free, independent” people. When we saw a cowboy in the wide countryside we could understand this connection. In some unstable years this group of people decides to join the Russian Empire and became with the years almost complete a territory of Russia. Later Kazakhstan was an “Autonomous Socialist Soviet Republic” of the Soviet Federation. The time during the rule of Stalin was the worst for the people of this area. Forced expropriation and forced settlements of Russian was part of the daily life. Land and animals were taken from the landlords and were integrated in collective farming groups. A higher and middle class could therefore not exist. The cattle were staying constant grasslands. The life of a nomad was impossible. Diseases and overgrazing were ending in a huge famine. Two million people died. One million was leaving the country. Within a few years Kazakhstan lost almost the half of its inhabitants. Now there was a lot of space for the feared working camps. Furthermore several tests with nuclear bombs took place in this territory. In the south of Semej exploded in between 1949 and 1989 470 nuclear and hydrogen bombs. In average one explosion in a month. After the fall of the Soviet Union the country went into a process to reanimate the almost erased Kazakh culture. Nowadays even the Kazakh language is being taught in schools. The president assured with several changes in the constitution that he will be until his death the president of the country. At the same time several rights which are in the constitution like the freedom of speech, freedom of opinion or the freedom of association can’t basically is not ensured. Well I have to admit also we had to do some research about the common sights of Kazakhstan. This country is really a white spot on the tourist map. Some friends gave me some recommendations and also the internet and the guidebook had some useful information. 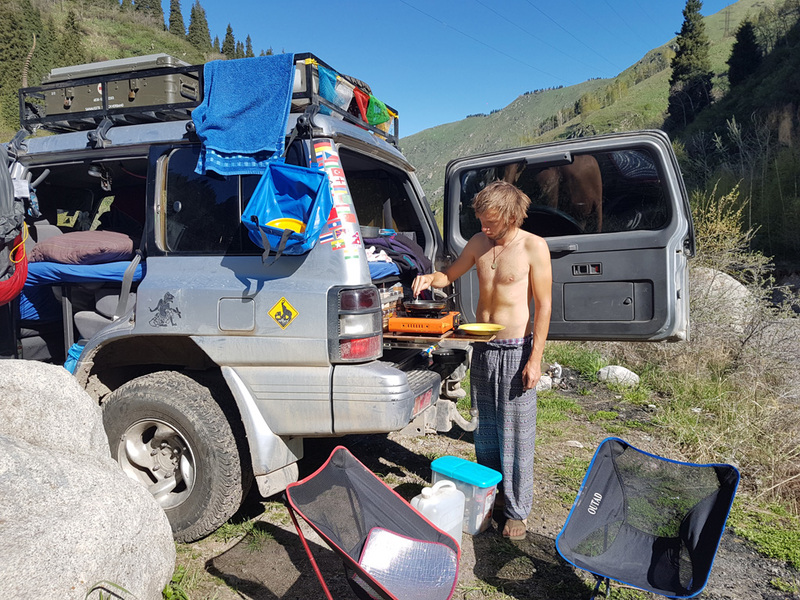 We crossed the border from Bishkek, Kyrgyzstan and spent two nights in the Ile-Alatau-National Park close to Almaty and one night in Almaty itself. Then we continued to the Charyn Canon before we had a quiet night at Lake Tuzköl in the very east. Afterwards we spent two nights in the beautiful Altyn-Emel Nation Park and crossed then the Kazakh steppe with Lake Balchach and the capital Astana. From there we left Kazakhstan to Russia. This national park is the local recreation area of Almaty. The recreation seeking people from the city also left some traces and their trash most of the time doesn’t land in the bins. There are many wild camping spots in the valley for friends of camping. Exactly the right thing for us. We stayed right next to the river and the noise of the river was making us not hearing the noise of the nearby road. Some leftovers also showed us that these places are also used from young couples. Anyways we enjoyed the nature and the magnificent view to one snow covered peak which was glowing red in the hour of the sunset. 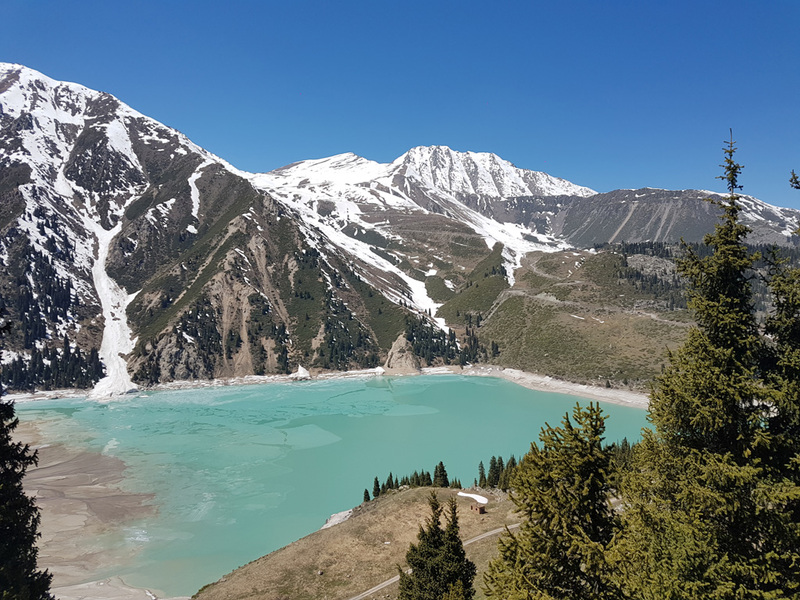 Our day hike started at the Great Lake Almaty which is also the water reservoir of the city. It was not allowed to go to the lake shore which is secured by soldiers. 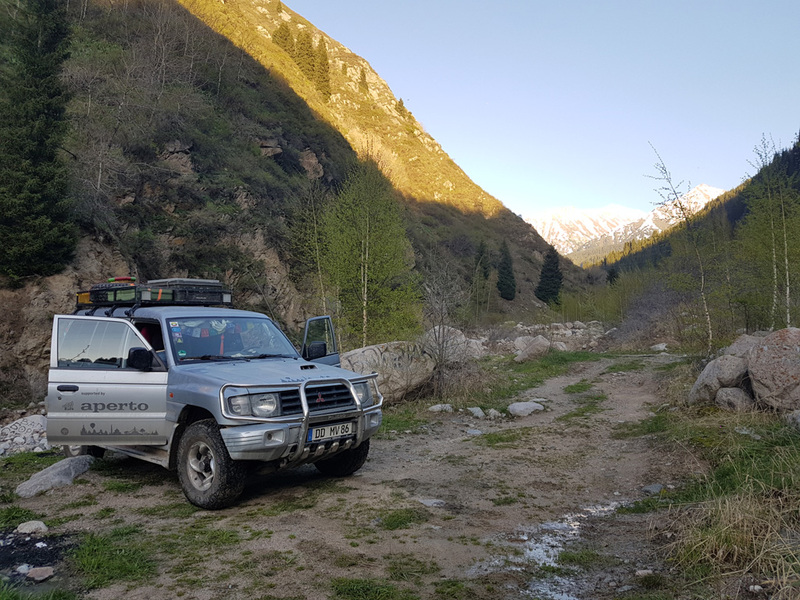 We entered a path which is going to the border of Kyrgyzstan. This path was very famous and many people used to hike to Lake Issyk Kul on the other side of the mountains. But this is nowadays not possible since Kyrgyzstan and Kazakhstan are now two separate countries. We met a local who gave us the advice to climb one of the lake surrounding peaks. But the paths weren’t marked and some climbing parts almost ended in tragedies. 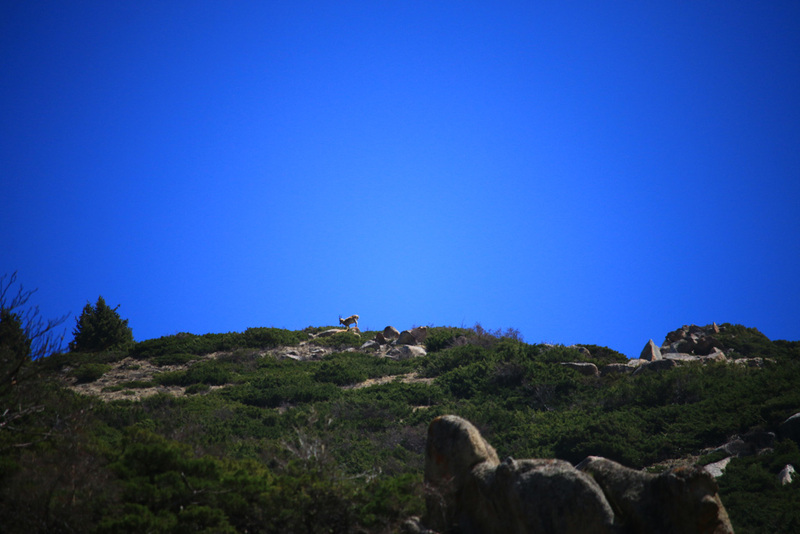 Still we could spot some ibex and had an incredible view to the turquoise colored lake. Hi from Israel !! I couldn’t agree with you more !! KZ is a fabulous country with friendly and helpful people. I was there with my wife last year(2016) and now we will tour with our 2 small kids , hiring a 4×4 to give us the freedom to move around. I will follow many of your recommendations. Fantastic post and great pictures. One last word, Almaty is the greatest culinary city I have ever seen, with food from every corner of the globe .The indoor decor of the restaurants should be copied everywhere in the world !! Awesome! Going to KZ next summer (2018). Did you rent a car in Almaty? With which Company? 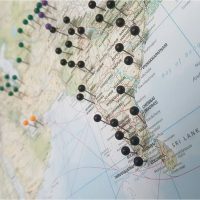 Awesome to read your experience.